Turkey hunting vests are a great addition to any turkey hunter’s gear. They can provide storage for the many things modern hunters use in the woods. Most of the time it is a trek into the woods to find your spot to hunt, and having the vest that can carry all your needs is a great thing to have. What type of turkey hunting vest you need really depends on what kind of hunter you are. Are you a minimalist who carries only the essentials, or are you a hunter who has multiple gadgets and calls to haul around. Turkey hunting is one of the more challenging hunting sports out there. They are very wary, and are not easily fooled by cheap calls, or cheap camouflage. With that in mind, finding the best turkey hunting vest can sometimes take a bit of time, and thinking on the hunter’s part to find what they really need. A few of the more important things to consider are: storage, durability, and comfort. Now this is extremely important to consider. Take a good look at what you will be bringing with you on every hunt. How many pockets will you need to carry the things you find essential. Also, how easily it can be retrieved is another consideration to take note on. Fumbling through pockets to find the right call, or reload is not very appealing to turkeys, or any game bird for that matter. One thing I find handy in some vests is a game pouch. It enables you to carry up to a twenty pound bird most the time. Finding one that is waterproof and resistant to blood is a great bonus, but if not a strong plastic bag will do the same work. Stay away from Velcro if you can help it. Velcro is incredibly noisy, and will spook just about any bird in a flash. Zippers, magnets or even snap buttons are a much better choice. Remember to look at what you are bringing and decide from there. The more pockets you have, the easier it is to put things in wrong places, or be fumbling about looking for what you need. It is a good idea to practice with your calls and other gear, so it becomes second nature what goes where. We all know, as hunters do, that comfort is one of the most important aspects of clothing. Turkey hunting vests are no different in this aspect. They need to be able to distribute the weight evenly across the shoulders and back, especially if you are carrying your kill from the woods a half-mile or further. 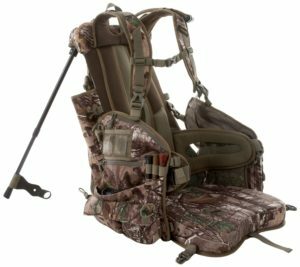 Many turkey vests come equipped with a seat, which is a great addition for those long hours sitting in the woods. Some even come with a back support. When looking at these kinds of options, it really depends on the hunter. Keep in mind that the price of a vest goes up pretty quickly when adding all this extra stuff. Material is important as it can determine how heavy or light a vest will be, and also how durable. If you are hunting in the colder parts of the country then having a heavier vest might be optimal, however it should not be the reason for buying one or not. The purpose of a good turkey hunting vest is to keep you organized, and have what you need at a moments notice, not to keep you warm. Since your vest is the outermost layer of clothing, it will take the biggest beating. A bulky vest can get hung up on trees and branches, or anything else poking its head out to make your day a little hectic. Where I hunt, there is a lot of underbrush that can snag just about anything. Look at your hunting grounds to determine what kind of vest is right for you. The weight your vest is going to hold should be an important factor for durability. Look for a turkey hunting vest that has multiple straps and loops to attach extra gear if needed. I always check the seams and other areas where one piece is connected to another. Anything pulling apart, or loose strings is a bad sign. Turkey hunting vests can run into the hundreds of dollars for higher end brands. Do not let this be the decision making point, though. I have seen three hundred dollar vests make it through only two seasons, while my sixty dollar vest is still going strong after five. This is not saying that you should find the cheapest vest possible, though. The guide above should point you in the right direction of what a good turkey hunting vest is made of, and should have. Remember that it is a personal choice above all, and what works for your buddy might not be the best choice for you. Here is a great choice for any hunter. This vest is not too bulky, but still manages to have plenty of cargo space to carry all those calls, cell phone, ammo, and whatever else might be needed. It has eight diaphragm pockets, two fold down table pockets, with extra pockets within. Two slash side pockets, and two box call pockets. 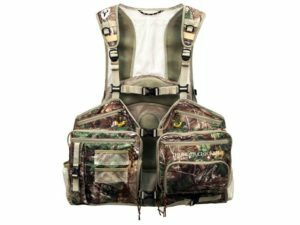 This turkey hunting vest comes with a detachable seat that has a waterproof bottom, and PVC material for gripping the surface it is on. The seat is contoured to fit very comfortably. It also has an organizational panel and inner pockets for the more important gear, or electronics you may be carrying with you. For comfort it has padded shoulder straps, and upper back mesh panel to allow air to move out, keeping you dry and comfortable. 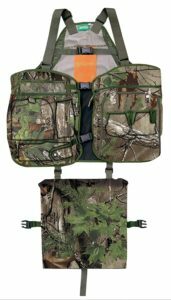 It also has a stain resistant game bag, with a blaze orange flag, so when moving to and from your hunting spot, you will not be mistaken for something else. This vest is a little more spendy, but has some added features that some hunters may find useful. It has a kickstand frame for sitting nearly anywhere. 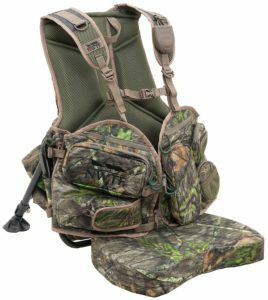 The thick padded fold away seat is sure to be a nice addition for any hunter who sits for long hours. It even has a smart phone sleeve so you can use your phone without having to remove it. The shoulder straps are detachable, so when you are set up, you can have easy shooting mobility and comfort. It comes with a stain resistant game bag, and blaze orange flag for safety. Multiple pockets for strikers, box calls, and a removable pocket for diaphragms. It also has two water bottle pockets so you do not get thirsty out in the woods. The side compression straps help this turkey hunting vest to be one of the best for any body type. With all the amenities, it comes in at about 6.4 lbs, which is not bad. The cross body straps help to distribute the weight evenly and comfortably. This pack is one of the higher end packs on the market today. It has a structured aluminum frame to keep it light weight. Spring loaded adjustable legs that will give you some flexibility when leaning back and forth. The seat is magnetically fastened so it does not make any noise when pulling it down. This pack really looks like a small lawn chair with its padded backrest and legs. The straps on the shoulders are padded, and come with a chest strap for distributing weight evenly. It has two slate pockets, three striker sleeves, six mesh pockets, with a total of fourteen pockets just on the front right side. On the left is a box call pocket, seven shell loops, and thirteen more pockets for a grand total of twenty eight pockets. This turkey vest also comes with two hand warmers on either side for keeping those fingers toasty while waiting for the perfect shot. It also has a game bag, that is expandable to hold more than one if needed. Also has an orange pull over for the hunters safety when moving through the woods. This turkey hunting vest is great for the hunter on a budget. While the price is lower, it still delivers on quality. It has a zippered pocket with 6″ expandable mesh pockets located on the inside that are ideal for the Camp Owl, Hoot Flute or Walkie Talkie. It has a pocket for camera, bug spray, blind material, and many other things you may need on the hunt. It has specific call pockets for your box call, strikers, and diaphragms. Detachable cushioned seat for a comfortable place to squat when waiting for that tom to wander in. Orange safety strip for walking in and out of the woods. It is very lightweight and comfortable. Cinch straps hold it tight to the body, making it easy to get through that brush, not that going through brush is ever that easy. It also has a large pocket on the back for carrying game or decoys. Pockets for camera, bug spray, blind material, etc. While all these are good vests, and I recommend any of them depending on your hunting needs, at the end of the day there can only be one winner. For all around hunting and especially turkey hunting, I would have to go with the Alps Outdoor Grandslam vest. It has the most comfortable setup for the price. For the money, this is the best vest you can get. All four of these vests are great, but in the end you have to choose what is right for your specific needs. As always, happy hunting.